The success of campaigns for nondiscrimination protections hinges on the effectiveness of efforts to build familiarity with, and understanding of, transgender people. Misrepresentations of transgender people have been used to stop nondiscrimination protections and even repeal existing laws that protect lesbian, gay, bisexual, and transgender (LGBT) people. Public education efforts are critical to overcoming this challenge. And because we know that early and repeated education about transgender lives is a crucial inoculation against the opposition’s attacks, community advocates should consider implementing these efforts long ahead of formal nondiscrimination campaigns. This guide includes the most essential information needed to help introduce transgender people to a public that needs accurate information about their lives. It also includes sample Trans 101 resources that campaigns can consider reproducing in their own education work. Transgender is a term used to describe people whose gender identity differs from the gender determined at birth. Gender identity is a person’s internal, personal sense of their gender. For transgender people, the gender determined at birth and their own internal gender identity do not match. Gender identity is not visible to others. Being transgender is different than being lesbian, gay, or bisexual, which are terms that describe someone’s sexual orientation. Sexual orientation describes a person’s enduring physical, romantic, and/or emotional attraction to another person, while gender identity describes a person’s internal personal sense of their gender. Transgender people may be gay, lesbian, bisexual or straight, just like non-transgender people. (Source: GLAAD). For more more key transgender terminology, visit the National Center for Transgender Equality here. Understanding gender and sexual orientation can be complicated. 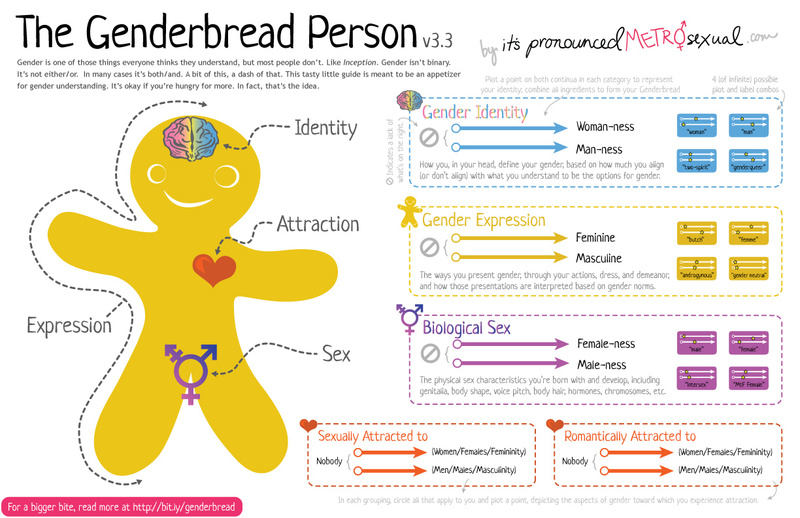 For a deeper explanation, we recommend reviewing the Genderbread Person (v3.3) here. The Williams Institute at the UCLA School of Law estimates that there are nearly 700,000 transgender people in the United States. According to new analysis by the Williams Institute, at least 300,000 transgender Americans could be affected by anti-transgender legislation introduced in 2016. According to the American Psychological Association and the American Psychiatric Association, being transgender is not a mental illness. However, the negative experiences transgender people may encounter because of anti-transgender bias may lead transgender people to suffer from anxiety, depression, and other mental health conditions. We Are Utah: Trans Lives in the Beehive State: Part of Equality Utah’s Transgender Awareness Project about the lived experiences of transgender Utahns and their families. I AM: Trans People Speak: A video-based storytelling campaign by the Massachusetts Transgender Political Coalition (MTPC) and GLAAD. I AM: Transgender Virginia Speaks: Modeled off the MTPC and GLAAD campaign, Equality Virginia has launched a video campaign aimed at showing the diversity of transgender people. #TransRespect: An ad campaign by the District of Columbia Office of Human Rights. The campaign aimed to increase awareness and respect of transgender people while educating Washington, DC residents of their right to report discrimination with the Office of Human Rights.